On Friday, May 22, at 10 p.m. EDT, Saturn will be in opposition to the sun. This means that it will be directly opposite the sun in our sky. It will rise as the sun sets in the evening, shine brightly all night long, and set as the sun rises at dawn. On May 22, Saturn reaches opposition with the Sun. It will be right on the border between Libra and Scorpius, just above the three stars which form the Scorpion’s claws. Credit: Starry Night software. If you just look at the sky on a single night, everything seems quite static. But if you watch Saturn over a period of a few weeks and note its position against the background stars, you will see that it is in constant motion. This retrograde motion puzzled early skywatchers, who though the planets must go around it tiny circles called epicycles. This was because they incorrectly believed that the Earth was fixed in space and everything revolved around it, the “geocentric theory.” Once Copernicus made clear that the sun, not the Earth, was the center of the Solar System, the geometry of the planets’ motion became much simpler. 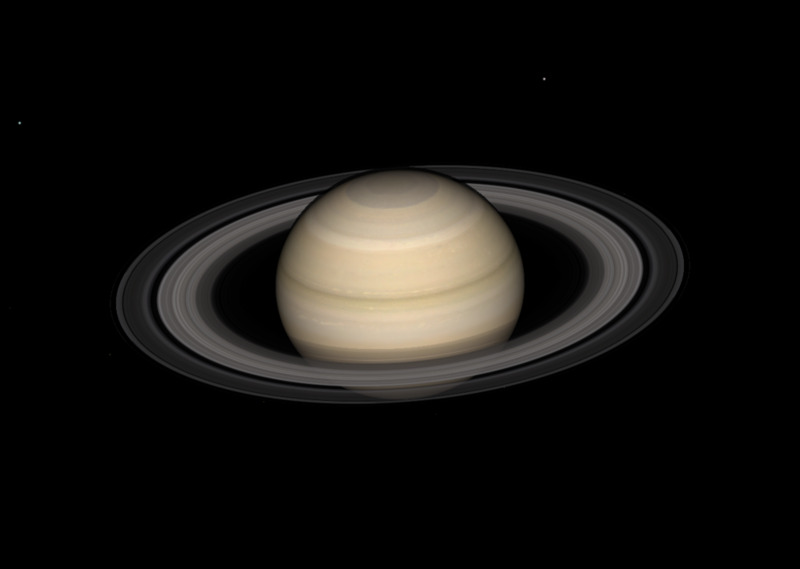 Saturn, like all the planets, is much smaller in angular size than most people realize. I once tried an experiment to see how much magnification was needed to see Saturn’s rings. With a binocular magnifying 10 times, Saturn looked just like a bright star. With a 15x binocular, I could just see a hint that Saturn was oval rather than round. It took a telescope magnifying 25 times to see Saturn’s true shape, though even then no detail was visible. I generally use magnifications of 150 to 250 times to see the details of Saturn and its ring system. Saturn really has multiple rings, of which the brightest are the outer A ring and the inner B ring. The A ring is noticeably darker than the B ring, and the two are separated by the dark Cassini Division, named after 17th century Italian astronomer Giovanni Domenico Cassini, who was the first to observe it in 1675. Cassini also discovered four of Saturn’s five brightest moons. The Cassini Division separates the A and B rings. Titan, the largest and brightest of Saturn’s moons was discovered in 1655 by Dutch astronomer Christiaan Huygens. It is visible in even the smallest telescopes. It is the second largest moon in the Solar System (after Jupiter's moon Ganymede), the only moon to have a dense atmosphere, and the only moon other than our own to have been landed on by a spacecraft. Huygens was also the first person to deduce that Saturn’s rings were flat circular objects in the plane of Saturn’s equator. Further study has shown that they are made up of thousands of tiny fragments of rock and ice. I once watched a star pass behind these rings, and the star continued to be visible, since there is more empty space that rock and ice in the rings, making them translucent. Saturn’s smaller moons are worth looking for if you have a good telescope. The brighter ones are visible in a 90mm telescope. Because they are in constant motion around Saturn, you need a planetarium program like Starry Night to identify which ones are visible on a given night. Most of the bright moons move in the same plane as the rings, so appear to trace ovals around the planet. In a telescope at about 150 power, Saturn is small but beautiful in its perfection, the jewel of the Solar System. Look around the planet for its brightest moons. Credit: Starry Night software. Iapetus is a particularly interesting moon. Its orbit lies outside those of the other bright moons, and is tilted at an angle of 15 degrees compared to the other moons and the rings. Like all major moons in the Solar System, Iapetus always keeps one face permanently turned towards its planet. The side of Iapetus which leads it around in its orbit has encountered a large amount of debris, painting that face of the moon dark black. When that blackened side of Iapetus is facing Earth, at the moon’s greatest elongation east, it is almost two magnitudes fainter than when the trailing side of Iapetus is facing us, at greatest western elongation. Right now Iapetus is close to its western elongation, so is at its brightest, magnitude 10.1. By greatest elongation east on June 27, it will be at its faintest, magnitude 11.9. The globe of Saturn itself is rather bland when compared to its more active neighbor Jupiter. It shows a system of darker belts and brighter zones, but their contrast is muted compared to Jupiter. From time to time bright spots have been observed in Saturn’s cloud tops, but they have short lives compared to cloud features on Jupiter. In large telescopes, the polar regions of Saturn take on an olive green color. It is interesting to observe the pattern of shadows on Saturn. The rings cast shadows on the globe of the planet, and the planet in turn casts its shadow on the rings. I have observed these shadows in a telescope as small as 90mm aperture under steady seeing conditions.